A woman and child pass the Holy Donut on Park Avenue in Portland in this Feb. 7 BDN file photo as a fast-moving snow storm engulfs the city. 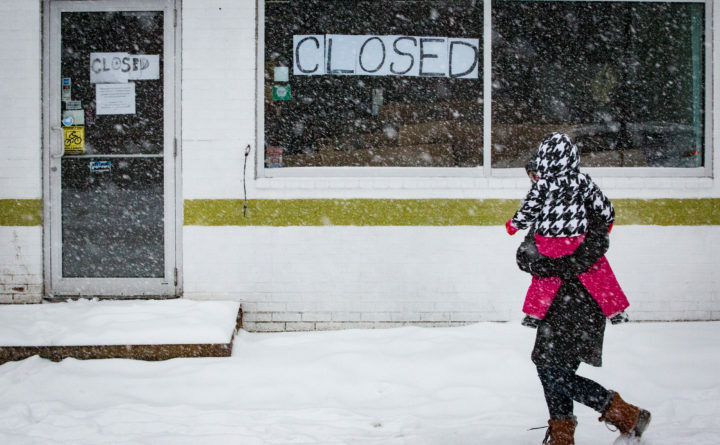 The donut shop closed at noon, like many most schools and businesses, because of the storm. A York plan to add 30 minutes to every Monday school day to help make up for the school time lost due to snow cancellations was nixed by the Maine Department of Education. YORK, Maine — It will be back to the drawing board for local school officials, after the Maine Department of Education put the kibosh on its proposal to add hours to the school year that would offset snow days. Unless school officials are able to come up with another alternative, it is likely snow days will be tacked on to the end of the school year, as has typically been done. Interim Superintendent Mark McQuillan had wanted to institute what he called the “Monday plan,” adding 30 minutes to the school day each Monday for the remainder of the school year to cover anticipated extra snow days. All five built-in snow days have already been spent this school year. The plan did receive support from many parents who commented on social media. York is one of the only districts in the area that doesn’t start school until after Labor Day, largely due to summer job commitments, so students get out later than many school districts. York Teachers Association members worked in conjunction with administrators to come up with the Monday plan, which was supported by the entire membership. He said he pointed out, unsuccessfully, that the Monday plan “would carry student learning time three days over what is normally required for a legally acceptable school year (175 days),” he said. He said that “given the likelihood of more snow days in the weeks ahead, the School Committee will continue its search for alternatives to the Monday Plan” and will discuss the situation at its next meeting March 7. “My hope is between now and then, we can develop a new plan that will prove satisfactory to both parents, students and faculty,” he said.